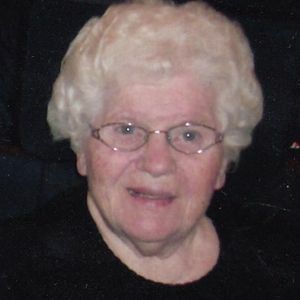 Juliann VanDenBosch, 92, of Zeeland, was welcomed into the loving arms of her Savior on Monday, April 15, 2019. Juliann was born a twin on April 26, 1926, in Holland, to Timen and Johanna (Rietman) Slagh. After WWII she married Andrew VanDenBosch when he returned from serving in the Pacific Theater and they raised their family in Zeeland. Juliann worked at Herman Miller for 20 years prior to her retirement in 1986. Juliann and Andy (Butter) were members of First Christian Reformed Church. Andy preceded her in death in 2014 and her daughter in law Debra Vanden Bosch in 2018. She was also preceded in death by four brothers, several in-laws, and her dear twin sister Thelma Rouwhorst. She is survived by her children: Duane VanDenBosch of Zeeland, Diane and Bob Friesema of Racine, WI, Daryl VanDenBosch of Zeeland, Denise and Wes Vander Lugt of Zeeland, Deb and Mike De Vries of Hudsonville, Chris Haan of Zeeland; 22 grandchildren, 26 great-grandchildren, siblings: Geneva Berkenpas, Reva Nykamp, Carolyn and Roger Brandsen; in-laws: Hazel Slagh, Arlene Slagh, Delores Slagh, June Vanden Heuvel, Cliff De Jonge, Darwin Fuglseth, Arlin VanDenBosch, several nieces and nephews. A funeral service will be held at 11:00 am, Friday, April 19, at First Christian Reformed Church, 15 S. Church St., Zeeland. Visitation is 5-7 pm, Thursday at Yntema Funeral Home, 251 S. State Street, Zeeland. Memorial contributions to Multiple Sclerosis Society or Hospice of Holland. Add your thoughts, prayers or a condolence to Juliann's guestbook.